Dance of Fire (Fire Dance) is Ramayana Dance performance at the end of the show added to the Sang Hyang Jaran Dance performances. This dance is known as a colossal dance monkey dance involving 50 to 150 people dancing to a large extent composed of male players to wear clothing babuletan (fabric that is used in harmony diselinggi by several accents and ceremonies, etc.). Lighting used in this show is a lamp shaped like a temple arranged and placed in the middle of the stage while the entire top of the players sitting around outside. The attraction of this show lies in the fabric of his vocal music is rhythmic, multi-layered (multilayer). 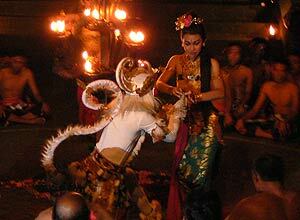 Fire dance brought the play “Kepandung Goddess Sita” (abduction of goddess Sita) from the epic Ramayana. 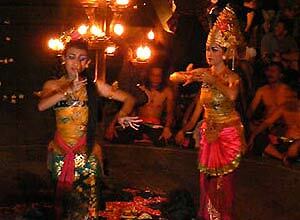 After the abduction of goddess Sita drama ended, the show continued with the show adengan Dance Sang Hyang Jaran. Part of this show featured a male dancer who menungganggi doll horse and dancing in the embers of the fire. Part performances that exude the atmosphere of this magical singing choir accompanied by fire dance player. Sang Hyang Jaran dance first performed only in certain seasons, when an outbreak of disease or are there any events that are considered strange and disturbing the public. This dance developed in the city of Denpasar, Badung , Gianyar and Bangli regency . However, after masukknya tourism, public support for the dance which was formerly functioning as a repellent against disaster or outbreak of this disease makes imitasinya performances to be presented as performance art tour by adding the Ramayana story at the beginning of the show. Trample scene riding embers that are displayed on this show actually is not really sungguht trance (trance) because the presentation of this scene was arranged beforehand and in the disclosure of which is strengthened by the expression of the dancers. Scene 1: Rama Sita and Admiral are in the forest suddenly appears a golden deer (the incarnation of king Ravana aide assigned to fish for Rama to leave Sita alone) approached them and then move away as if to invite them to play to see the cute deer that Sita asked to the king Rama to catch it. Before leaving Sita Rama, Rama asked his brother Admiral guard Sita and Rama to leave Sita and admirals to pursue the golden deer that ran away … … …. Not every few laps and then came the sound of pain that sounds like Rama and asked for help … …. Hearing that Sita was worried and then asked Admiral to follow Rama, the Admiral did not believe that that voice is the voice of Rama Rama because he knew could not be harmed by the scores of deer. But Sita would not understand him even angry at the Admiral and Admiral accused intentionally allowed Rama to die so he could marry Sita later. Due to continued urged by Sita Lakshmana finally go after Rama. Before leaving Sita alone Admiral create lingakaran and asked Sita to stay within the circle. After the Admiral left then appeared alone pastor who is actually a manifestation Ravana. The priest was asking for water to Sita. Feeling sorry for Sita provide water to the priest with his hand stretched out circle. Immediately the old priest turned into Ravana. Then take Sita away. Scene 2: Narrated Sita has been in the kingdom of Lanka was accompanied by Trijata – nephew of Rahawana assigned to guard Sita. Sita looked sad cry over the fate that befalls sanbil keep hoping Rama came to the rescue. Then came the White Apes – Hanuman. At first thought Sita Hanuman is also an incarnation of Ravana, but after the Hanuman explained that he was the emissary of King Rama, and handed the ring as proof. Then Sita gives interest to Hanuman for submission to King Rama. Before leaving the kingdom of Lanka Hanuman set fire to the park and few places in the kingdom of Lanka as a message to Ravana that Rama would come to rescue Sita. Scene 3: The battle begins, with a servant named Rama and the army keranya Tualen arrived in Lanka to attack and destroy the kingdom of Ravana. In the early battles Ravana’s son and servant named Megananda Delem beat Binding Rama with her magic so that Rama and his men could not move and become limp. Then Rama prayed to the gods to save him untu k, then a bird garuda munculah help Rama Megananda break away from the magic. Scene 4: Then Rama and his army back then recover as usual King Rama ordered the monkey Sugria to fight Megananda, in this scene the dancer’s will form 2 groups, one group being a soldier Megananda, and one other group in the army Sugriwa. In this battle defeated Sugriwa Megananda. Then the dancers smack back into one group. Scene 5: Told that can be defeated Ravana and Rama have been reunited with his wife Sita. Their meeting was attended by Admiral, Sugriwa and Hanuman. At each end of the staging of all the dancers supporters will gather on stage and invite visitors to make memories with pictures taken together. 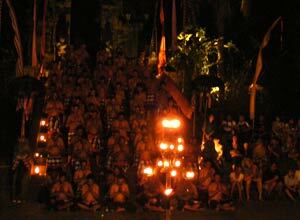 The capacity audience to watch together at Uluwatu fire dance reached 500 people.